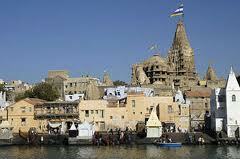 Here is Some information about Dwarkadhish Temple in Dwarka Gujarat India. Nearest Airport : The Nearest Airport is Jamnagar Airport. Nearest Railway station : Dwarka has its own Raiway station, so nearest raiway station is dwarka. 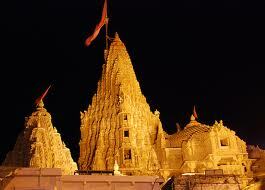 Dwarka is one of four most holy pilgrimage sites (Chardham) of Hindu faith and is associated with Lord Krishna's life. The holy town of Dwarka in Gujarat has a history that dates back centuries. Situated on the banks of river Gomti, the city is famed for being the capital of Lord Krishna. The ancient Dwarka city is believed to have been submerged by raging sea waters to the bottom of the sea, where the remains are still believed to exist. A temple was built at the site around 400 BC by Vajranabhji, the great grandson of Lord Krishna, however the present structure was built during the 16th century in a typical Chalukyan style of architecture. The beautiful temple rises up to a height of 51.8 mts. Also known as the Jagat Mandir, the temple has two shikhars. The Nij shikhar is where the idol of Lord Dwarkadhish is placed. The huge temple consists of 60 exquisitely carved pillars and a number of beautiful sculptures that depict the influence of various dynasties such as the Guptas, Pallavas, Martraks, Chavdas and Chanakyas, that ruled Dwarka over the years. The entrance to the temple is from the north, also known as the Moksha Dwaar while towards the south is the Swarg Dwaar, from where a series of steps leads down to the banks of river Gomti. According to legend, the temple was constructed in a single day by Vishwakarma, the lord of construction. 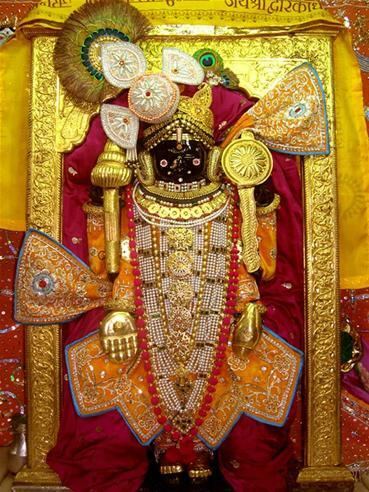 The idol of Lord Dwarkadhish is made of shiny black stone and is about 2.25 ft in height. The four hands of the Lord carries a conch, wheel, a metallic weapon and a lotus each and is popularly known as 'Shankh Chakra Gada Padma Chaturbhuj'. It is said that the idol was hidden for years to protect it from invaders while another idol brought from the Rukmini temple was installed in its absence. The original idol was reinstalled during the 16th century after the construction of the new temple. come daily from Dakor to Dwarka, in order to have a glimpse of the Lord Dwarkadhish. The Lord was really appeased with her and one day, he went along with Badana to Dakor, in the form of idol. The priests at Dwarka temple got angry at Badana, who took the idol according to them. The enraged priests chased Badana to get back the idol. Badana convinced the priests to leave the idol instead of gold. Restaurants serve traditional vegetarian Gujarati, South and North Indian cuisines. Alcohol is prohibited in Dwarka. Here is the list of some famous and popular Restaurants very closed from Dwarkadhish Temple. The other temples in Dwarka are the Trikamji temple, Kalyanrai temple, the Patrani temple, Durvas temple, etc. Sharda Pith set up by Adi Shankaracharya imparts instruction in Sanskrit. Darukvan in the region is one of the Jyotirlingas. Nageshwar Jyotirlinga Temple is on of twelve Jyotirlingas of Hindu Lord Shiva is major tourist destination of Hindu pilgrimages. Rukuni Mata Mandir, Nageswar temple, Gopi - Talav, Bet-Dwaraka are also most famous tourist destination in dwarka. By Air : Jamnagar is the nearest airport from Dwarka while Rajkot is another option to access the place by air. Government run Indian Airlines and other private airlines such as Jet Airways and Air Deccan operate regular services to both these locations. Ahmaedabad is another major airport which is connected by regular flights from all the major Indian cities. By Rail : Dwarka has its own railway station which connects it to other major cities in India. Regular trains are available from nearby cities such as Jamnagar, Rajkot and Ahmedabad. The best way to reach the place is to board a train to any of the major cities around and take a train to Dwarka from there. By Road : An excellent network of state and national highways runs through the entire state of Gujarat connecting it with other Indian cities. Interstate and local buses connect Dwarka with other cities within and outside the state.